The conductor ambled up to his podium as a wave of silence moved across the audience. Tap, tap, tap. The maestro has arrived -- the music streamed out; string, wind and percussion intertwined into one. 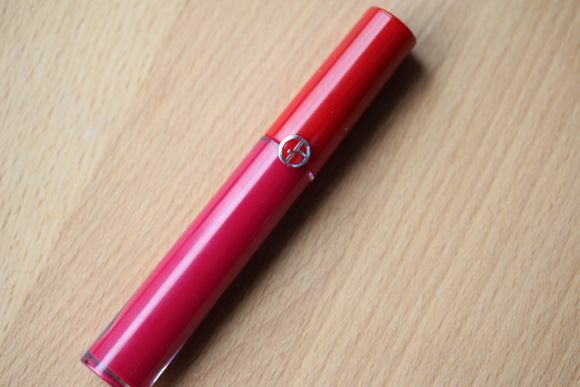 Armani's Lip Maestro is a gloss which dries down to a semi-lacquered finish, lasts hours and eventually turns into a lovely stain. This is the sort of lippie that takes you from morning to night. The last time I found something such as this, I didn't think anything could come close. Like those cheesy infomercials out there, you can "set it [lip maestro] and forget it." Lip maestro's formula is non-drying and non-sticky, two big thumbs up in my book! With that said, I still like to apply chapstick on my lips prior to putting anything else on them. Ecstasy 504 is a vibrant and bright fuchsia pink. Initially it appears red (see swatch above), but a few minutes after the glossiness wears down the lovely pink hue is finally in clear view. If you're worried about feathering/product migration, line your lips with Makeup Forever's Lip Line Perfector; it'll stop your lipstick dead in its tracks. 8 out of 10 bags – I had to take a couple of points off for price and colour selection (Ecstasy 504 is one of the twelve shades available for purchase). I wouldn't mind trying a lighter colour for work, perhaps Blush or Casual Pink will do?